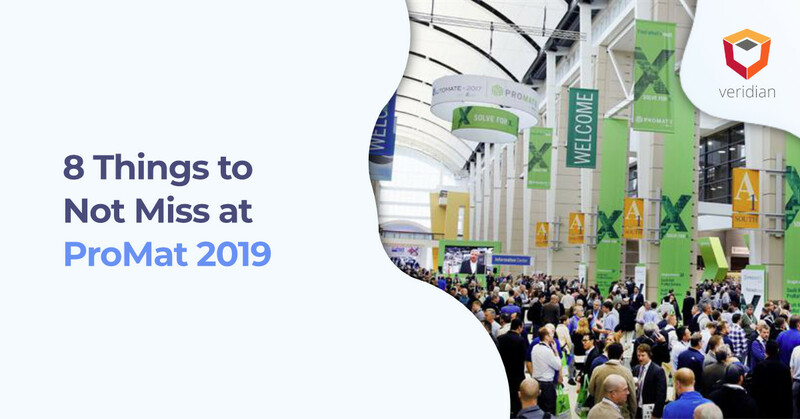 ProMat 2019 is set to take place April 8-11, 2019 at McCormick Place, Chicago. The four-day conference brings together 950 exhibitors and the thousands of supply chain and manufacturing software vendors. It’s an excellent opportunity to connect with other businesses and learn how you can take your supply chain to the next level. The conference is so expansive that it can be hard to decide which seminars and booths to visit. So, let’s check out the top eight must-see aspects of this year’s conference. The first keynote presentation for this year is presented by Karim R. Lakhani of Harvard Business School, focusing on the use of blockchain technology for supply chains. The keynote begins at 8:45 AM in Room S100 on Monday, April 8, and Lakhani will share his insight into how blockchain can impact transparency, trust in the supply chain, payment processing and much more. Next, Reshma Saujani, Founder and CEO of Girls Who Code, will launch the second keynote at the same time and location on Tuesday, focused on overcoming obstacles of women working in supply chain circles and closing the gender gap. On Wednesday, George W. Prest and Scott Sopher will offer a preview of the MIH 2019 Annual Industry Report. The final keynote will be Wednesday at 1:00 PM, presented by Marcus Lemon is of CNBC’s “The Profit.” Lemon is set to share his experiences and how success boils down to people, product and process. The exhibit floor has more than 360,000 ft2 of exhibitors. ProMat organizes exhibitors into industry-specific Solutions Centers, including Manufacturing and Assembly, Fulfillment and Delivery, Information Technology, Drones and Sustainable Facility Solutions. Understanding the needs of your business is the best way to think about which exhibits to visit. Those with a need for greater automation may consider visiting the material handling and equipment systems’ booths, and others with tech needs should check out the latest in warehouse management and control technologies. Also, ProMat 2019 has published an online, searchable list of exhibitors too. We suggest visiting the booths of the tier-1 WMS providers, HighJump, JDA, and Manhattan Associates. Veridian has partnered with these companies because of their ability to deliver omnichannel solutions to companies around the globe in every imaginable industry. Go speak with them and find out what they can do for your supply chain. Fulfillment is in the process of being transformed by automation. What started with full-scale automation companies like Dematic and Intelligrated, has been picked up by a slew of smaller companies that can deploy robots to move products, reduce human travel, and automate repetitive tasks like picking into a tote or put-wall. Check out the very cool product offerings of Berkshire Grey, Kindred, 6 River Systems, Fetch, Locus, Magazino, and Bastian Solutions. In addition, Voiteq and Honeywell VoCollect will have booths at the event for voice picking technologies. An excellent reason for attending ProMat 2019 is the chance to meet and connect with other businesses in the industry. C-Level executives, manufacturing managers, IT directors, third-party logistics professionals, and procurement professionals make up a fraction of the people that you will meet at the event. Ultimately, the event is a great way to put faces to company names and leverage the latest tools and resources to boost your organization’s efficiency, success, and profitability. Industry night is one of the most engaging opportunities to meet with others in the industry, as well as enjoy beer, wine, and hors d’oevres. This year, Craig Ferguson, host of The Late Late Show, will be providing the witty entertainment for attendees. The event is scheduled for Wednesday from 4:30 to 7:00 PM in the Grand Ballroom (S100) and costs $50. In addition, attendees may win a fabulous door prize of a luxury package vacation valued up to $30,000. It’s too awesome not to attend. Our very own Sandeep Patel will be presenting a seminar on machine learning in supply chain management in Theater A on Tuesday from 1:20 PM to 2:15 PM. The seminar will focus on digital transformation in supply chains, advanced technologies, how to implement machine learning and results from such transformation. Veridian will have a booth at the conference, offering information for businesses in need of better testing and configuration, as well as supply chain systems integration. Those that stop by Veridian at Booth S2885 also have the opportunity to enter for a chance to win a YETI Haul cooler by visiting our ProMat 2019 resource hub. Of course, those ready to put the experience of Veridian to work can visit Verdian online to learn more about our services and capabilities. Schedule time to meet with us or just stop by (don’t worry about logistics…we will ship the YETI to the lucky winner). Organized by the Association for Advancing Automation (A3), Automate rivals ProMat with a leaning towards industrial automation. Your ProMat badge provides full access to another 160,000 ft2 exhibit floor, which boasts a mind-boggling list of robotics companies that are getting this fourth industrial revolution underway. One common misconception about ProMat is its cost. The conference is free to attend, and registration is still open. However, there is less than a month until the big event. The opportunities for your business are too high not to attend this year’s conference. We highly encourage you to register to attend and see Veridian at Booth S2885. Vision and Voice in the Warehouse: How Are These Technologies Impacting Warehouse Management? © 2019 Veridian Information Systems, LLC. All Rights Reserved.